"Behold my true form, and despair!" you get the idea. Bets are good they'll become way more bloated, ugly, or plain disfigured. And with this new form, their power grows immensely. This indicates that the villain means business and it's time for the heroes to get cracking. Named in honor of Sephiroth, Final Boss of the video game Final Fantasy VII. (Okay, named in honor of his theme music, as he has in fact seven wings, but just one in place of an arm.) Video games in general absolutely adore having their final boss do this, even when their original form is scary enough anyway. In fact, it's gotten to be somewhat of an arms race: thanks to the popularity of Frieza in 1991, three-form bosses are now somewhat common, and those games going for "epic" will sometimes go for even more. In JRPGs, particularly, it is rather common to see two stages of One-Winged Angel: the "bizarro" form, that is huge and scary, and the "angel" form, that is winged, eerily beautiful and accompanied by Ominous Latin Chanting. Once beaten, or on becoming even more powerful, the villain may cross the Bishōnen Line and into safer territory for an Evil Makeover to work its magic (though it's a case of Tropes Are Not Bad; as much as it's used, you'd be hard pressed to complain when they turn into something completely awesome). Usually accompanied by the stock phrases "No one who's witnessed this form has lived to tell the tale! ", "I have only begun to fight! ", or "This isn't even my final form!" Sometimes you never even fight their human form at all and they immediately turn into a monster. Can count as The Unfought if they showed fighting ability in their human form. This is more popular among minor video game villains who will often transform into tougher versions of earlier monsters like in the Breath of Fire and early Final Fantasy games, as a unique battle sprite for them would take up extra development time and storage space on the cartridge (one unique boss could take the space of several mooks, more with the use of a Palette Swap). Interestingly, heroes, particularly transforming characters, have been known to occasionally use this "turn into a big scary monster" tactic for their Super Modes as well. It's extremely rare for it not to cross into Superpowered Evil Side territory. And for those with firmer morals, this qualifies the villain as a monster, making it fine to kill him. One way to defeat a villain who became giant is to become one yourself. A fight of giants can be even worse than a single giant, but it may be done anyway if there are no other options left. Scaled Up and Make My Monster Grow are major subtropes. Super Mode is a sister trope. See also Power-Upgrading Deformation, I Am Not Left-Handed. Compare Emergency Transformation, Lovecraftian Superpower, Came Back Wrong, and Not Even Human. Some subversions are to make it a Clipped-Wing Angel or Power Up Letdown. 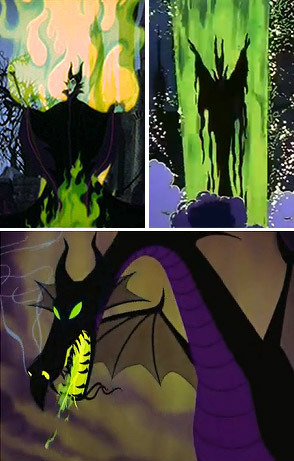 When the transformation is caused by the character's pain or anger it's Hulking Out. For when the transformation is the villain dropping their humanoid disguise and assuming their true, more powerful form, see This Was His True Form. For those looking for actual winged people, see Winged Humanoid, Our Angels Are Different, and (most relevant to this trope,) Power Gives You Wings. Before adding examples, please be aware that this trope is not about "just" transforming into a monster. It's not even about villains who can transform into a monster. It's a plot trope for final battles with villains.